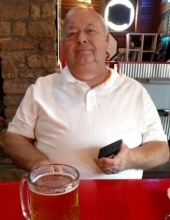 James “Jim” G. Falls, 71, of Bowling Green, Ohio passed away April 11, 2019 with his family by his side. He was born November 3, 1947 in Bowling Green to Jack and Pat (Stevens) Falls. He married Diana Gibson on October 2, 1970 and she survives in Bowling Green. Jim was a 1965 graduate of Bowling Green High School. He served his country proudly as a Sergeant in the United States Army during the Vietnam War. In 1971, he began working as the “Parts Man” for Al Smith Chrysler Plymouth Dodge in Bowling Green. He later went on to work for Charlie’s Dodge from 1988 until his retirement in 2012. Jim was an avid NASCAR fan and enjoyed camping with his friends at numerous race tracks. He was a Detroit Tigers fan and could often be found with his buddies going for a drive to get coffee or “after hours” at the American Legion or Buster’s in Maumee. He was a lifetime member of the VFW in Bowling Green. His greatest joy in life came from the time he spent with his family, especially his grandchildren. Along with his wife of nearly 49 years, Diana, Jim is survived by his son Shad (Brenda) Falls of Perrysburg, Ohio, grandchildren Allison Falls and Brandon Falls, brothers Chris (Joyce) Falls of Lake Orion, Michigan and Mike (Tracy) Falls of Portage, Ohio, his nieces Katie Culver, Amanda Juliano, and Morgan Falls as well as his great nieces and nephews. He is also survived by his Aunt Marian (Stevens) Dunn and numerous Dunn cousins. He was preceded in death by his parents and sister Laurie Falls. Visitation will be held on Tuesday April 16, 2019 from 5:00 to 8:00 p.m. at Dunn Funeral Home, located in the Historical District of Bowling Green at 408 West Wooster St. His funeral service will be held on Wednesday April 17, 2019 at 10:30 a.m. at the funeral home. Atonn Smeltzer will officiate. Interment will follow at Wood County Memory Gardens in Bowling Green where full Military Honors will be rendered by the Wood County Honor Detail. Memorial contributions may be given in his memory to Myasthenia Gravis Foundation of America 355 Lexington Ave 15th Floor New York, New York 10017 or The Bowling Green VFW. To send flowers or a remembrance gift to the family of James "Jim" G. Falls, please visit our Tribute Store. "Email Address" would like to share the life celebration of James "Jim" G. Falls. Click on the "link" to go to share a favorite memory or leave a condolence message for the family.